Insider London’s Street Art Tour shows you the work of world famous street artists where it’s meant to be seen: on the street. We’ll show you how street and graffiti art has evolved, showing you everything from an early Banksy piece, to work from heavyweights like Shephard Fairey, Space Invader and Roa, and the latest work from emerging street artists. We’ll also swing by a series of street art galleries to show you how street art is shaking up fine art on a global scale. We found this article over at The Londonist. Where are the best places in London to see street art and graffiti? 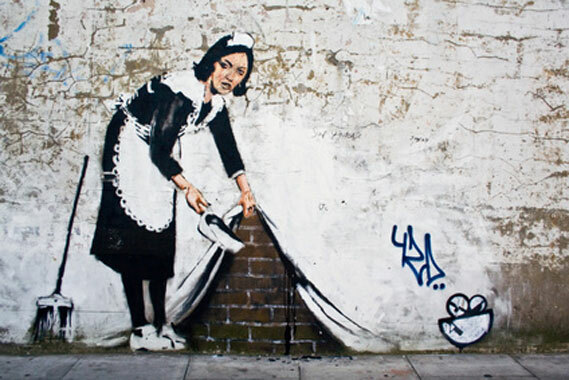 We asked our friends at Global Street Artfor their top tips. The sunken ball courts at Stockwell Park Estate (also known as ‘The Pen’) are on Aytoun Road (see this map link). There is enough space for roughly 20 graffiti pieces, which change over almost every week during the summer. Photographs of the pieces here posted on the internet have led to a culture of international graffiti writers wanting to paint there. One local writer, Solo-1, pours a huge amount of time and effort into keeping the place clean, and the impact has been measurable over the past decade. You’ll often see superb pieces by Bonzai, Lovepusher, Cemo and Solo-1, among many others. Community Trust Housing is well-aware of the cultural value of the space and often takes tours of councilors around the ball courts. Also, if you’re in the area and looking to take pictures of graffiti, Brixton Skatepark is a short walk away. East London is the centre for street art within the city. Seemingly limitless stencils and posters adorn the area, as well as more traditional graffiti pieces. From Old Street station you can walk down Great Eastern Street towards Brick Lane, ducking down Rivington Street, Curtain Road and Redchurch Street en route. Check out the walls by Village Underground (Great Eastern Street and Hollywell Lane), including the commercial wall the lovely folks at End of the Line run. There are other side streets with art along the way, and more just off of Brick Lane itself. Check out the giant Phlegm mural on Heneage Street (off of Brick Lane) that Global Street Art arranged! As West London has become more gentrified in the past 10 years, the amount of graffiti has fallen. There are still some places where great graffiti can still be seen, however, and the bottom of Trellick Tower is probably the best. It’s a relatively large space with high walls, where you can check out work by talented writers such as Vibes and Roids. Thanks to the efforts of various writers, who help keep the space clean, the quality of the graffiti in Trellick Tower has gone up over the past year, with writers typically painting larger-scale pieces. Leake Street is just around the corner from Waterloo Station. It’s by far the most accessible and convenient graffiti space in London and was the site of Banksy’s 2008 Cans Festival. New work goes up all the time but, sadly, a lot of it does not last long enough to get good pictures. Good work is often tagged over quickly. Sometimes you might get lucky and see some cool pieces by Tizer, Cept, Parlee and others, especially just after a jam or on a writer’s birthday. After the top few locations, there are quite a large number of smaller graffiti spots around London, from ball courts to skateparks. Parklands walk is a former railway track that became a popular path for joggers and dog walkers. It runs from near Highgate Station (entrance off of Holmesdale Road) to Finsbury Park. There are a few bridges along the walk, a youth centre and a playground or two where graffiti is either legal or tolerated. Occasionally, you might see pieces by the Toasters, Whome and some of the Burning Candy folk. If you’re in the area you can also pop up to Alexandra Palace; there’s a skatepark there with space for a few graffiti pieces you can photograph. By Lee Bofkin / Global Street Art. The GLOBAL STREET ART Blog is so full of images, and interviews and news, you could spend hours on there. With new interviews coming up include Lisbon’s Pariz-1 (photo above), Mr. Wany from Italy, NYC-based Never, Payo from Quebec and three decade veteran graffiti photographer Steam 156. Stay tuned! Here’s some info from Pariz-1’s facebook page, now your journey into the world of Street Art has begun, will you be back for more ? Pariz One 27 years old, internationally recognized Graffiti Artist, with a degree in audiovisuals, and Creative Director at TDL. He began by doing graffiti in 1999, plowing this same time in the world of street art, bringing together the two artistic forms, becoming a complete artist in respect to street art. Since 2003 Pariz started his travels in Europe, which sparked the artist too a different cultural and artistic overview.He has work in several countries highlights include Germany, United States,Italy, England, China, France and Spain. 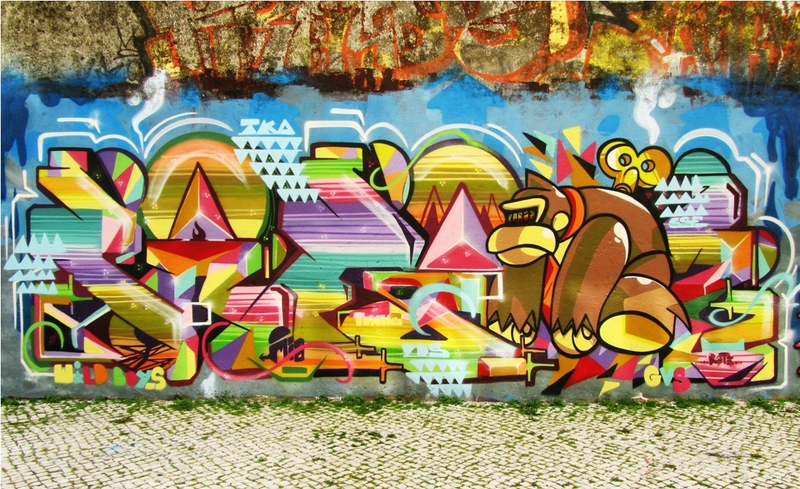 Having won competitions, Pariz includes several events, organized the Iberian stage of the graffiti world biggest challenge known as Write 4 Gold, and has painted in the world final, held in Germany as a guest artist. In 2008 initiates the project called “The Writers Bench”, a space dedicated to artists and graffiti street art, where you could find mounthly exhibitions. At about 9 years of Graffiti he started to do graffiti work on a professional level, for individuals, businesses companys and private and national brands such as Worten, APAV, MTV, Reebook,Sic, El Corte Ingles, Loja das Meias, CTT, Bench, Posca, Ziliani, Dedicated Store, Waves & Woods store, Dolaso, etc … Today he collaborate with one of the biggest brands of the world for graffiti,the brand Molotow, produces collections for Lonsdale and Dunlop in London and is the officia l artist of Music Monsters worldwide. Pariz is directly connected to the public sectors as the Lisbon City Hall, some joints Parish Councils throughout the country and the town hall of Wiesbaden in Germany giving wings to its proposed restoration and upgrading of public spaces. Part of 4 crews Graffiti Voodoo Skills (Portugal, Germany, England, Holland), Very Dirty Style (Portugal, Spain, Italy, Switzerland), Cannot Stop Fanatics (Germany, Italy), and TKO (United States). His works are scattered all over the internet, with interviews in several languages sites in several countries, films, documentaries, and was invited to work for the site ilovegraffiti.de, this site is No. 1 in the world at this time regarding the graffiti.